My life has become a lot busier now that I have got my chickens. I spend a lot of time outdoors now, compared with what I used to be like before I got ‘the girls’ to look after. My mind is always active, thinking of the chickens, working out how to deal with such things as quarantine (for new birds), mite and lice prevention, feeding, housing, cooling in summer, warming in winter and a host of other things that can crop up unexpectedly. One thing I hadn’t bargained for, when I went last week and bought two standard sized hens which are quite a bit larger than my two ‘commercial laying hens’ was that these birds can have difficulty getting up and down from a high roost. It was quite comical going out to the coop the first morning and having to lift these two big girls down from their perches, because getting up there was one thing, but coming down again from such a hight, was quite something else entirely. The roost in their temporary pen is quite high, and on a fairly steep angle and these birds are just too bulky to jump down from the top of it and risk leg injuries. So, I needed to come up with an idea to help them get up and down without needing me to lift them off the perch in the mornings. 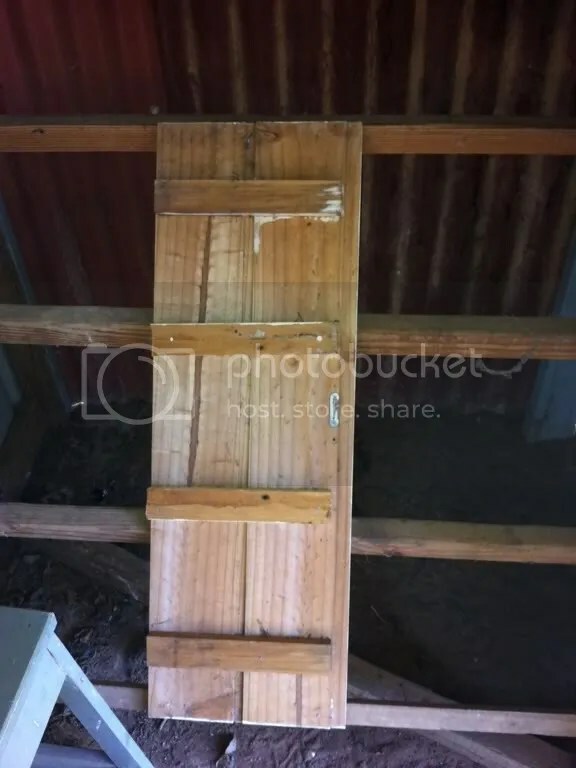 I did some research online, and asked a question or two in the poultry forums that I frequent, and managed to work out that we needed a ramp for the hens to use. Sandra came up with a solution the second day when she was standing at the living room door, looking out on our patio. There’s a very old, broken down cupboard on the back wall of the house, which we keep meaning to remove, but which up til now, we havent done so. One of the doors had fallen off this cupboard some time ago, and looking at it, Sandra thought that it might just fit the bill for our hens. That afternoon, we got the door and pulled all the nails and screws and hinges off it and used a part of the hinge attachment to cut some battens which we then nailed to the back of the door. This whole thing was then fixed to the roost using nails. It’s been on there a few days now, and I took this photo this morning when I went to check on the hens. They’ve been down from the roost, and happily pecking around their run each morning since we put the ramp up so they’re obviously using it. It has got some dirt and dust on it from their feet going up and down, so we’re calling this a success. I’m quite pleased with it, actually. We also put a stool into the coop with them and sometimes see one or the other hen sitting on it in the afternoon. They seem quite happy and settled in their cage, now and the other hens are getting used to seeing them. The next step will be trying to integrate the two separate ‘flocks’ into one in a week’s time. Hopefully that will proceed without too much difficulty. I am spending so much time with them or just generally pottering around outdoors, Sandra has taken to calling me Farmer Jill. LOL. It beats sitting around moping and feeling useless though, so I don’t mind. 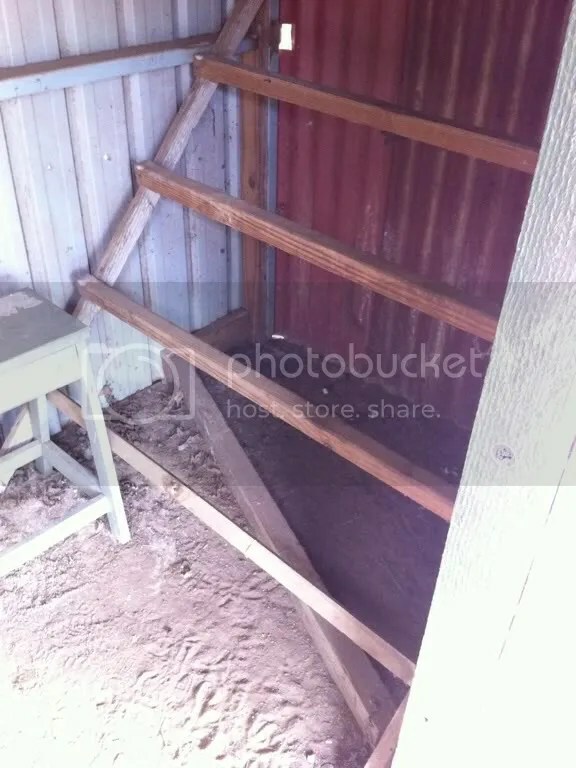 This entry was posted in Chickens, Self Sufficiency and tagged Chicken, Chicken coop, Poultry. Bookmark the permalink.